Well todays dig actually started off a few days ago. Earlier this week George had called me to come help him dig a couple pits on a construction site I arrived in Philly about 8 that evening and we planned to dig through the night. After digging the bottom 18 foot of a 26 footer and finding nothing it was almost 6 Am. We had planned for Doug to meet up with us in the morning and do another pit on the site but the other one also had the same kind of fill so we decided to try some other sites around town first. After finding some already dug pits and driving around until almost 2 that afternoon we finally got behind an abandoned house and had found a promising looking pit. It was a typical 5 foot across shared Philly brickliner with a large Granet slab covering most of the opening to the pit. And of course there were two rather good sized trees growing on either side of this privy. 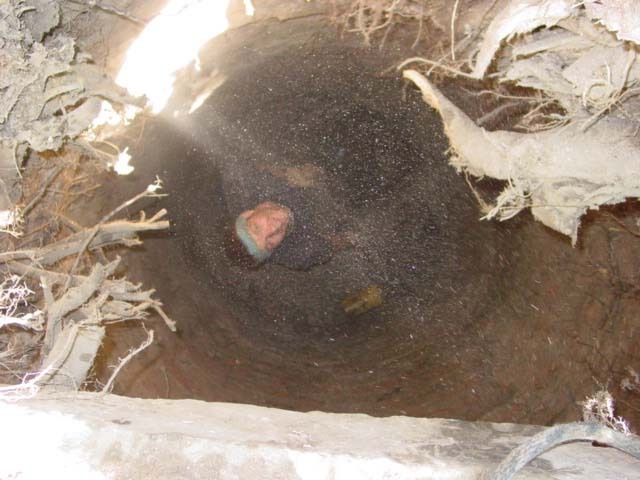 The small opening was almost clogged with roots growing in the soft ash that this pit was filled with. It took us hours of digging and chopping to get the hole opened up enough that doug could get under the granet slab and fill buckets. We were able to get this pit down about 6 feet when finally I decided that I was just too beat to dig anymore it was almost 7 that evening and I had been awake for almost 36 hours and spent 23 of that digging. Not to mention I still had an almost two hour drive home. I knew if I didn't call it quits and go home I'd probably not make it. So I told Doug and George the pit was there's and left. The next day Doug called me and said Him and George got the pit down another couple feet before it got dark then called it quits. So we made plans to go back up Wednesday and finish this pit. We arrive about 8:00 Wednesday morning and waited a few minutes for George to arrive he was stuck in traffic on 95. By about 8:30 we had our tools in place and continued digging the pit down. I was still nice soft ash then at about 12 feet we hit water in the pit. So things slowed down as we dug and baled out the water and ash. around 14 feet the ash gave way to a nice black use layer. It was black and mucky but had very few artifacts in it for the first couple feet the only bottle found was an 1880s amber strap flask. 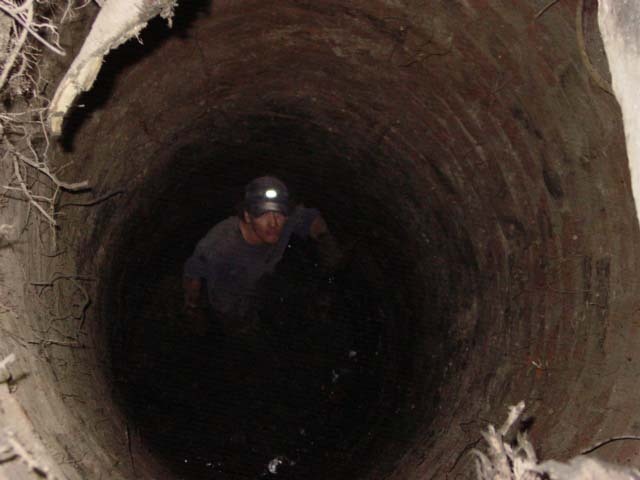 I gave the layer a quick probing and the probe said there was more trash further down so onward and downward we went. By around 16 feet while digging a new sump hole to bail out water a couple 1860s squat sodas floated up then a nice pontiled fancy mustard. I said alright the layer just got old and I could feel alot of artifacts in the muck with my screwdriver. The layer started producing lots of potiled puffs and a few embossed meds and sodas. 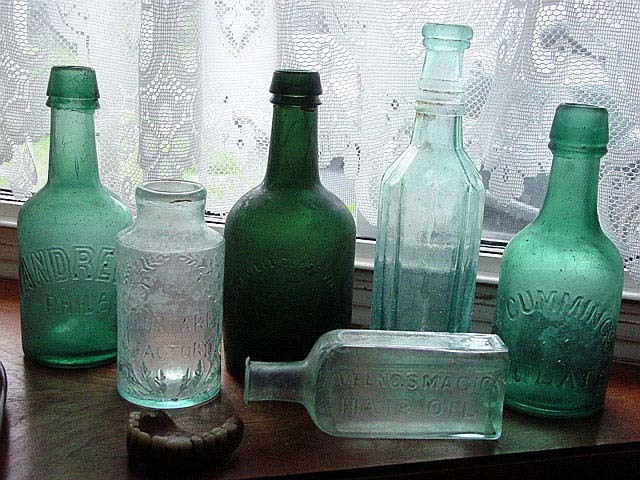 the best of which was a very rare 1830s Dr. Slauthers Specific Philadelphia, and a Veno's Magic Hair oil. 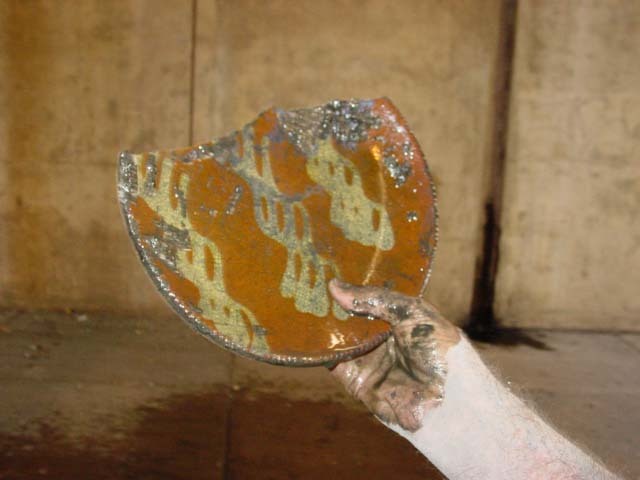 near the bottom we started getting lots of pieces of early slip decorated redware pie plates. Over all this was a nice loaded early philly brickliner. 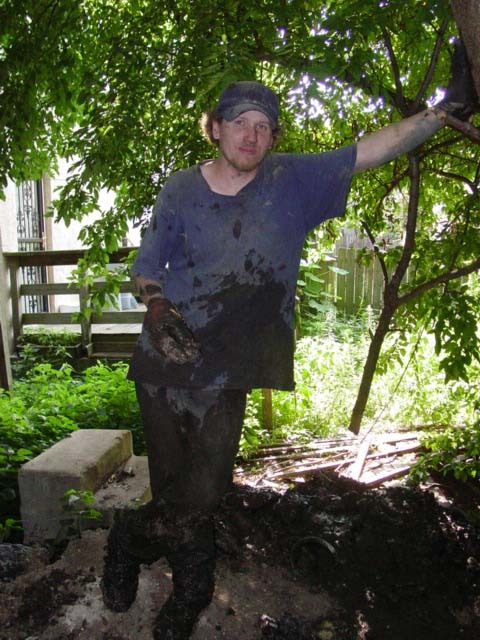 After I finished the layer I came out of the pit covered from head to toe in black muck. 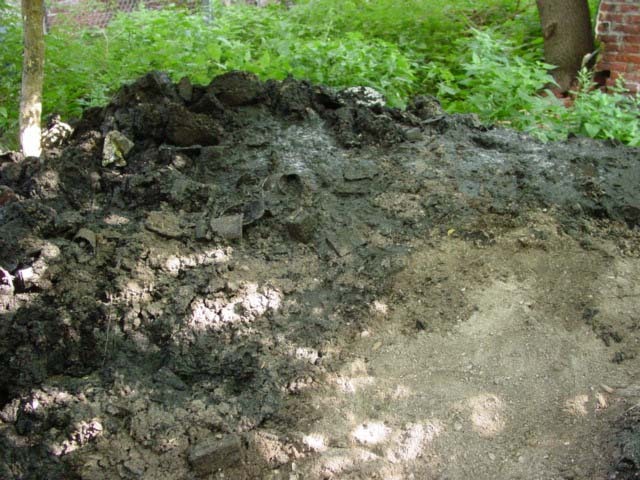 Then we put a bunch of trash that was around the yard in this one and filled it up with ash and dirt. 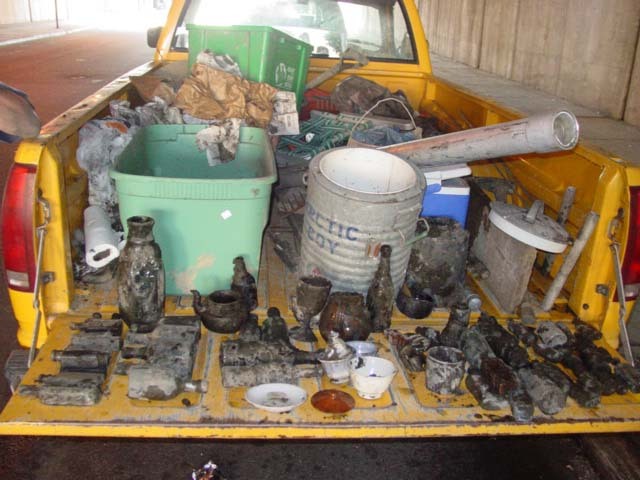 Called it a day and headed to a nearby parking lot to split up our finds. After the split we headed home I remember thinking it will be nice getting home before it gets dark. 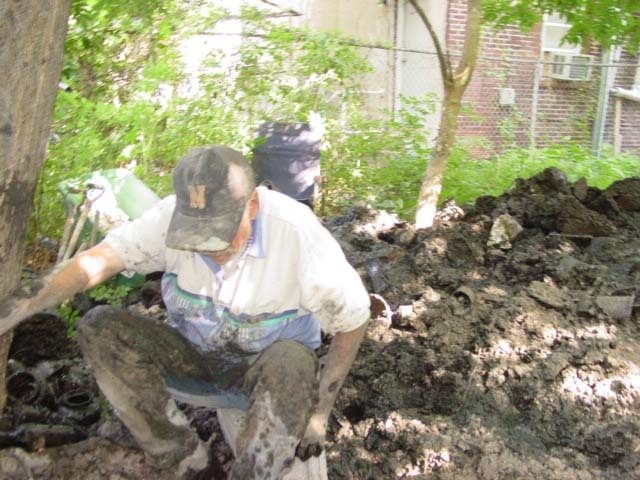 Not something that normally happens when we go to philly to dig.